Description: This is a single applicator with a thin tip on it. Handle is black plastic. Each tip is sold alone. Get as many as you may need. Description: This is a single applicator with a thick tip on it. Handle is black plastic. Each tip is sold alone. Get as many as you may need. Description: This is a 50 piece applicator set with 25 thick tips and 25 thin tipped applicators in it. Handles are black plastic and these come in a wonderful tube for storage with dual lids. Description: This is a package of 1 (one) Stamping Sponge from Hero Arts. Perfect for any crafting project whole or cut up into smaller pieces and use for Chalks and Watercoloring!! Description: These Sponge Daubers are wonderful for using with your Chalks, Inks and more. You can buy as many as you need, and order that quantity. For instance if you need 5 then your quantity ordered will be 5. Description: This is a Stylus Handle with Mlding Tips on each end. The design is called "Leaf". 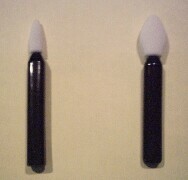 The White Foam Tip is the Blender and the Black Foam Tip is Moldable. Instructions are included. Size: 7 1/2" x 1"
Description: This is a Stylus Handle with Tips in the "Nova" pattern. The White Foam Tip is for Blending and the Black is for Molding. Description: This is a Stylus Handle with Tips in the "Blossom" pattern. The White Foam Tip is for Blending and the Black is for Molding. Description: This is a package of One Mini Molding Mat from Clearsnap in the Ornate Border Design. You can use this with Polymer Clay, Moldable Stamping Foam and the Stylus Moldable Tips. Instructions are included. Description: This is a package of One Mini Molding Mat from Clearsnap in the Jumbo Swirl Blocks Design. You can use this with Polymer Clay, Moldable Stamping Foam and the Stylus Moldable Tips. Instructions are included. Description: This is a single applicator with a thin tip on it. Handle is black plastic. Each tip is sold alone. Get as many as you may need. Use to apply chalks, rub-ons, glues, paints or powders. Description: This is a single applicator with a thick tip on it. Handle is black plastic. Each tip is sold alone. Get as many as you may need. Use to apply chalks, rub-ons, glues, paints or powders. Description: This is a set of the Pixie and Pudgie applicators (6 each). Gives you both the bold and fine tip applicators at a reduced price. Use for chalks, rub-ons, glues, paints or powders. Description: This is a set of 2 Applicator Pens for use with 3D Crystal Lacquer. You fill each bottle with your favorite color of Crystal Lacquer. This kit comes with a bottle with a 0.60mm fine tip, a bottle with a 0.35mm extra fine tip and a tip cleaning pin.